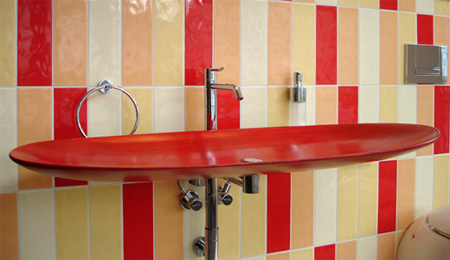 Modern bathroom sinks and creative sink designs from all over the world. 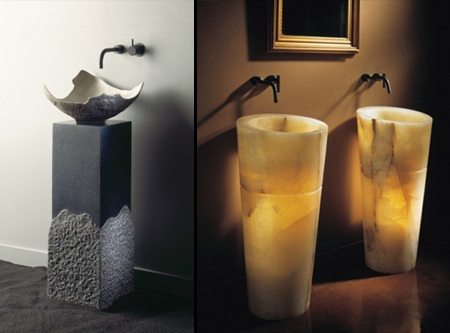 Beautiful sinks from Stone Forest are hand carved granite sculptures which combine the simplicity of Japanese style with contemporary design. With faucet & drain positioned at opposite ends of the sink, water cascades through the 8-inch-wide tapered preparation/work area, much akin to a stream or river. Eclectic, unusual and creative: in a word, “Splash”. 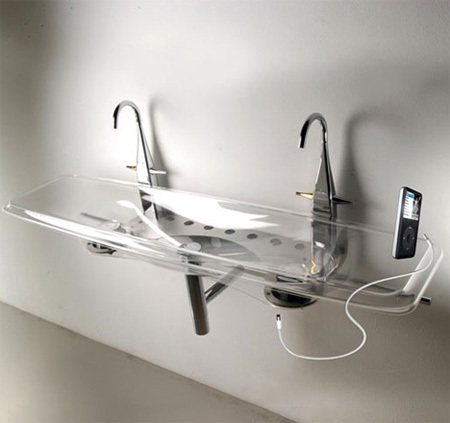 Designed by Jan Puylaert, the X-Light Surround basin comes with a built-in amplified speaker system for your iPod. Luxurious quartz sinks are made from 93% quartz that is specially processed into a composite suitable for the kitchen and bathroom. The raw, elemental qualities of glass provide an extraordinary showcase for the interplay of light and water in any bath or powder room. This is something you would expect to see in a museum. 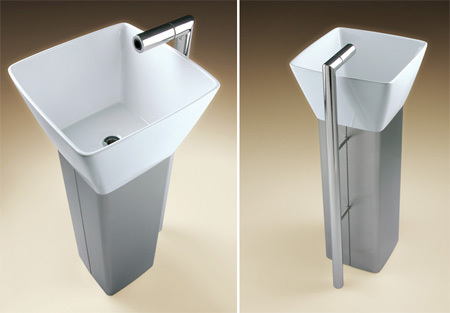 Flo is a completely free standing pedestal sink and faucet system. 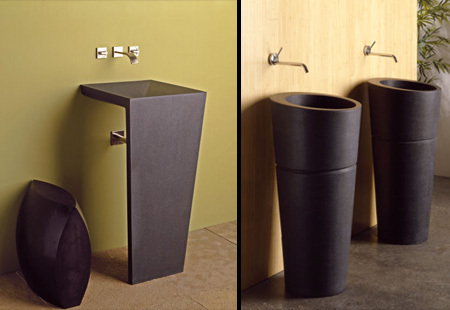 Vessels lavatories allow you to choose the sense of contemporary you want to express, from pure elegance to mathematical precision to fundamental form. 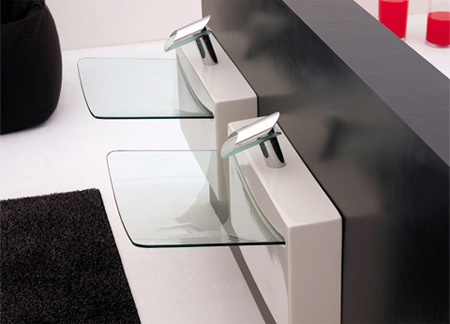 The Ocean series of modern sinks from Bandini are like interactive bathroom art for the user to explore. So sculptural, yet entirely functional, the eye-catching organic forms bring to mind the soothing motion of ocean waves. Perfectly symmetrical gorgeous glass sink from Cogliati-Cogliati. Ordering Vaselli is like commissioning your own piece of sculpture, each piece is truly made to order. Beautiful striped bathroom sink design from Olympia. An elegant compromise between design and functionality, the Onda Washplane is a contemporary sink from Omvivo that pushes the boundaries of design. 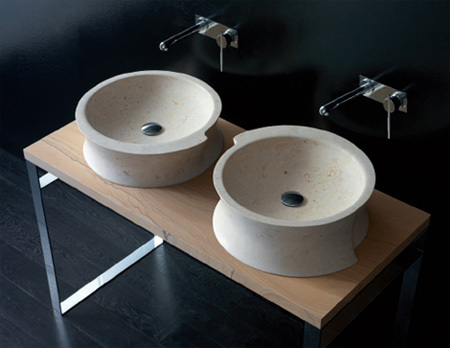 The sculptural qualities of the Prisma and Vela stone washbasins by Bandini can be appreciated when viewed from any angle. Made from Moonstone, they change and interact with the lighting, setting and viewer so that your experience is intensely personal. 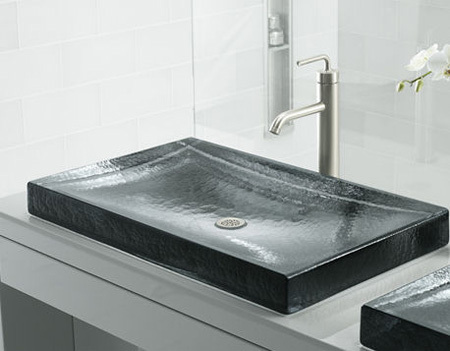 This beautiful sink from Ardino will look good in any bathroom. Flowood is an entirely new concept for bathrooms. It’s a patented system to produce wooden washing facilities. The water drains, naturally, elegantly, with the force of gravity, running down the slanting sides of the washbasin. At the bottom of the sink there is a gap that lets the water out. 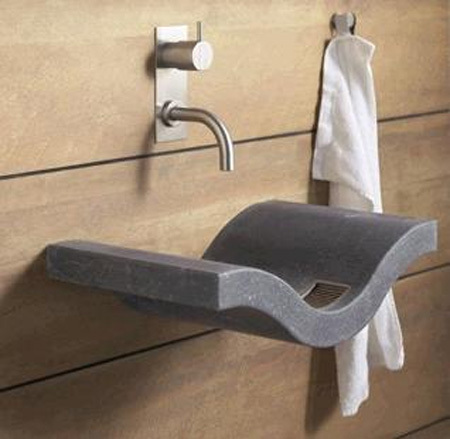 Modern sink design from B Dutch made from blue limestone. 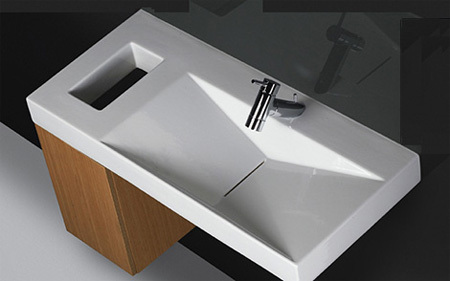 Beautiful glass bathroom sink designed by Urbinati for ArtCeram. Form over Function. Cliche over Unique Critique. What a great find – keep the interesting posts coming! Yea this site is pretty amazing, I’m glad I stumbled on it especially since I’ll be buying a house within the next few months. I’m excited to apply some creative design. beautiful interior designs :) amazing. this is so beautiful…..i love all your posts… if i want to market and then sell this kind of stuff in my country what can i do? whom to contact? Crystal wall sink pretty. Love this site, may it go on growing. You should have a Facebook group! Beautiful. But some of these ‘sculptures’ are not functional – I mean how can you fill up some of these sinks and let your pantyhose soak overnight??? I mean REALLY! 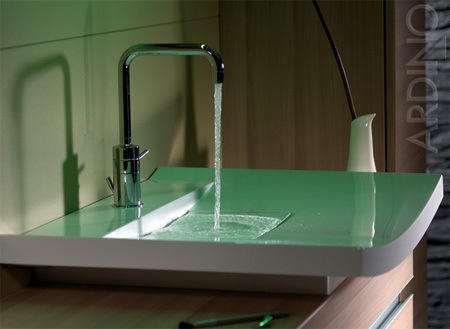 The water drains….with the force of gravity, running down the slanting sides of the washbasin. Wow. And i thought ALL sinks did that! but how does the water not over flow in the super shallow basins? I saw the last one at Home Depot. It’s fantastic! WOW! 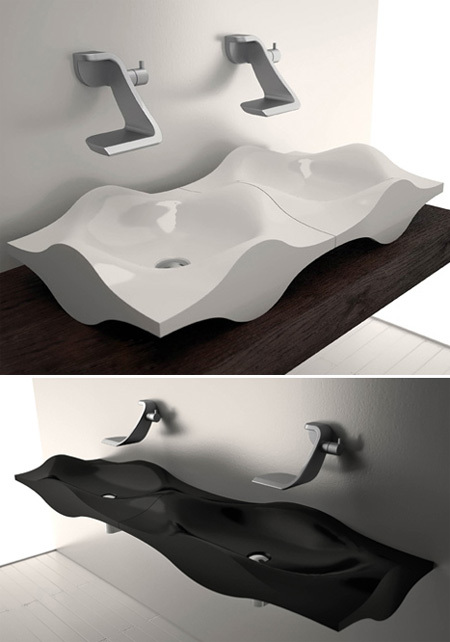 interesting sinks…makes me wanna buy ’em! Wow. Very few of these designers thought any of these designs through. They thought, “Well, shucks, it won’t be in my home!” and sent it on its way without a thought about its functionality. It’s a sink. It can’t ruin your tiles if you try to wash your hands. 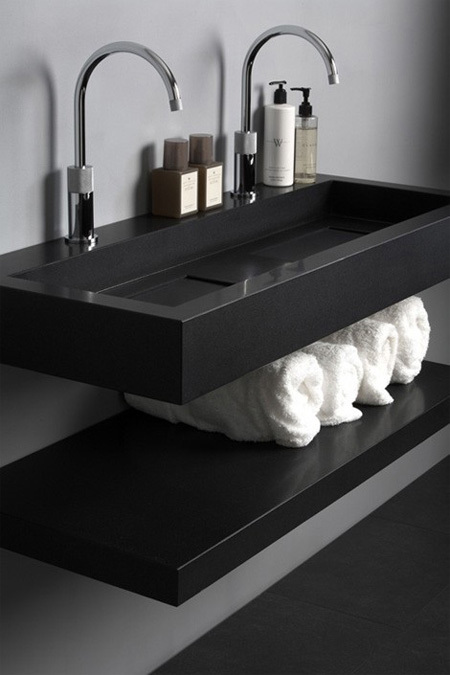 I was once in weekly rentals in Spain that sported those kind of sinks: a glass bowl and the quartz square sink. I was thrilled as they looked really classy, but I found the experience unnerving: I did not like brushing my teeth in a salad bowl, and cleaning the hard corners was a full time job. I like many, but would really only ever use one – the Mystic. It just seems to combine syle, organic feel and funtionality to me. Drop one into an island, either stone or wood, and it works for me. A lot of fascinating stuff! I love this stuff! amazing designs with nice creativity..
Amazing. You cannot but be impressed. I’m an architect,I think these are very excellent. Thaks alot. 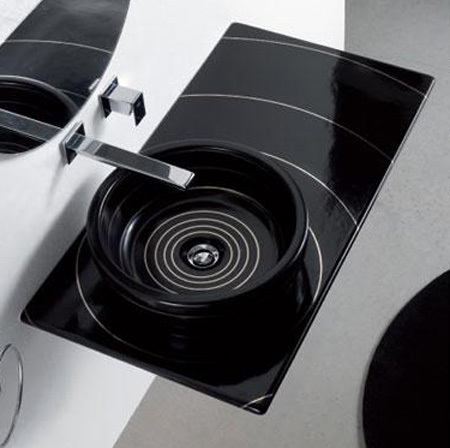 This website is amazing and the sink products are just fantastic… shame no prices are detailed… however I like the creativity! I like the Stone Forest Pedestal Sinks the best-not that others are not good… As for the shallow ones, although they may be so angled that all the water does flow down the drain but then you’d still get wet from the droplets which would bounce at you. 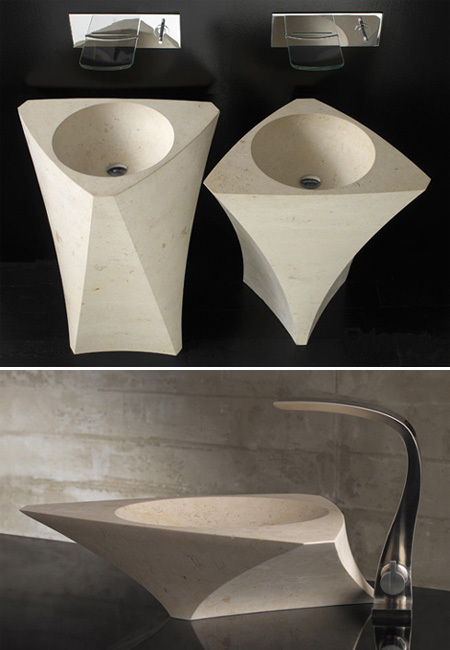 About the Stone Forest Pedestal Sinks I liked the last one-the one with broken edges. Just wondering if we can replace a broken earthen pot that could be a good idea for just washing your hands-I mean for small places where you just only put a sink to only just wash or rinse your hands-like the small ones under the stairways! Give it a coat of limewater and fix some enclosure to reduce the area of outlet so as not to present a gaping hole but a proper sink. Will it work?? Just wondering!!! Will use some stone ideas in our next project. 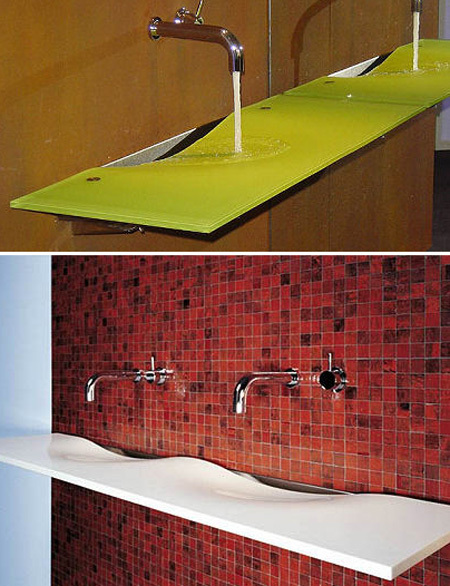 i love the splash sink! Pretty cool designs, but some are probably better for trendy bars and restaurants rather than in your home. Overall, most of them are pretty striking designs. The inner-lighted pedestal is my favorite. Really nice selection of products, but a very lame site design looks like a 80s Zellers or Kmart ad. Nice products need to be shown in a cool site. its time to maybe be as cool as the items you promote. These sinks look really nice, but wouldn’t water splash everywhere if the sink is so flat? the glass sink really jumps out at me. its just a shallow glass bowl, and i just think its really unique. 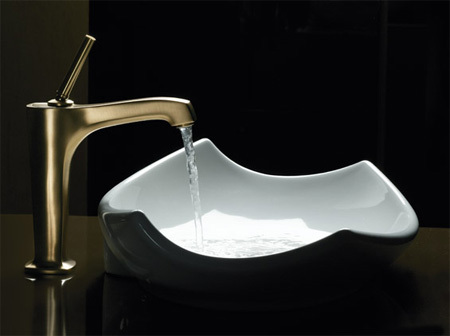 some wonderful faucets, basins, and stands: simplicity, creative, elegant, and practical. Futuristic, simplicity and glassy to keep one’s mind cool. haha. @jade. my thoughts exactly. people that have these amazing pieces of architechure in their bogs, dont actually use them, its all for show. love mystic sink, but splash sink would probably suit my place. 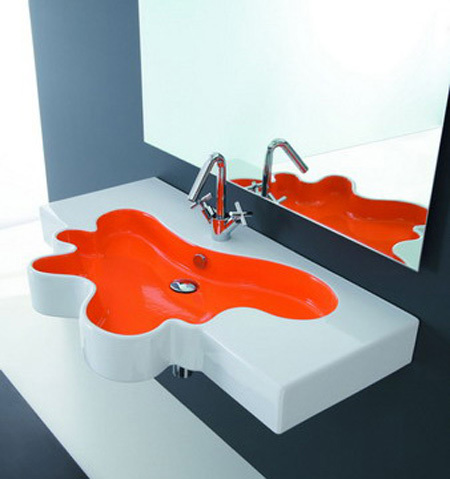 Im speechless too.. these sinks are all amazing!